We all have those moments in parenting. No, I’m referring to those moments that make us want to put a paper bag over our head. Where we turn shades of embarrassing red and want to crawl in a hole. You know, the kind that generate those #fail memes. 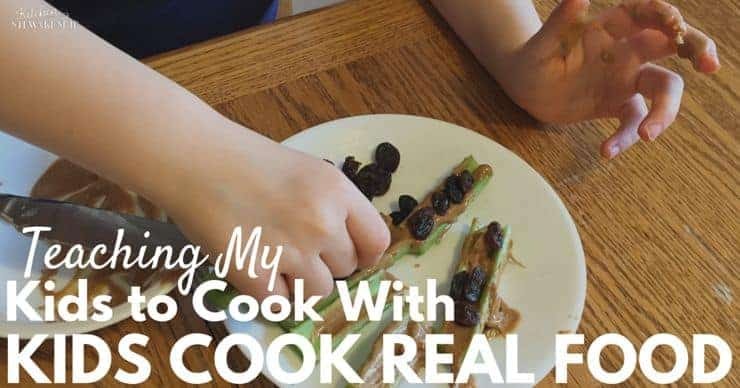 I had one of those glorious fail moments recently when we began the Kids Cook Real Food eCourse as a family. 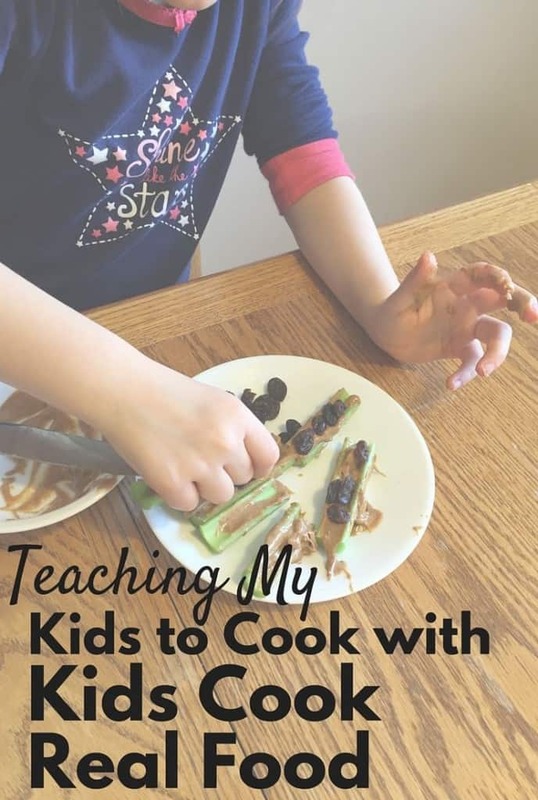 My 7-year-old and 4-year-old were eager to start the first Beginner lesson that involved peeling carrots and cucumbers, spreading butter on toast, and putting peanut butter on celery sticks. My kids set to the task of making our lunch with great vigor. We watched the video, prepped our food, and the kids let the peelings fly off the cucumber and carrots — jokingly calling Bonk! (using one of the video’s cues for safety). And then, the realization of my fail moment. I pulled out the butter knives for spreading … and my first grader’s eyes grew wide. That’s when I realized – she had never used a butter knife before. Like, ever. The never-used-a-knife-fiasco started out innocently enough. I always plate dinner in the kitchen and bring it out to the table. This helps control our portion sizes, ensures there’s enough to go around (especially on leftover nights), and grew out of necessity because for years we had a teeny tiny table that couldn’t fit more than our plates!!!! I also didn’t want to sit down to dinner, just to get up and help everyone with their food. Can I be honest for a moment? Mama works hard enough during the day to enjoy her dinner time! So I would take care of slicing meat, cubing potatoes, buttering bread, and prepping other various foods all by myself while in the kitchen. But the habit continued MUUUUUUUUCH longer than it needed to. And had it not been for the eCourse lesson, I’m not sure WHEN I would have recognized my habit-turned-error. It was just so easy to chug along with the way things were. Clearly, I needed to re-assess the situation. But there is some redemption to this story. 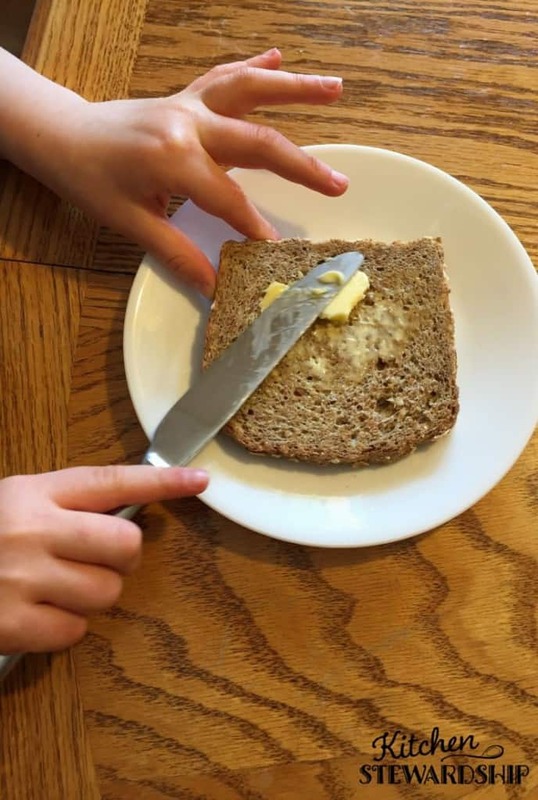 My 7-year-old quickly picked up butter knife skills and I haven’t made PB+J sandwiches or buttered toast since. It’s a freaking beautiful thing. She’s taking on new responsibilities and suddenly I find myself with more time and space in my life to focus on other things. Learning from my butter-knife-fail, I started looking at other areas of life where I was just shouldering too much responsibility. I cleaned all the bathrooms. I vacuumed all the floors. I laundered all the clothes. I did all the meal prep and clean up. Now before you jump in and say “Girl! Give your kids some chores!” you should know that you are absolutely right. I was doing too much and not letting my kids feel the weight of their responsibility. But it was an easy habit to slip into. We had just moved four months prior and it had been a hard transition (you can read more about this season with my story about cooking through depression). As part of our survival during that incredibly bumpy transition, we went into lockdown mode, which included most of our meals coming from our Emergency Meals List. And so as we adjusted to our NEW-normal in a NEW house with NEW challenges I settled into OLD habits in order to survive. I told myself it was just “easier” if I did it. And so I took on all the work and bore a burden I was not meant to carry alone. Katie said something in the eCourse videos that really left a mark on me: You won’t be wiping your kids’ bottoms forever and you don’t want to be cutting their apples forever, either. Until I was intentionally ready to let go, my kids would never have the opportunity or space to do these things that would blossom into important life skills. If you’re feeling a little overwhelmed about letting go and giving your kids more independence and responsibility in the kitchen, breathe easy. That means you’re normal. 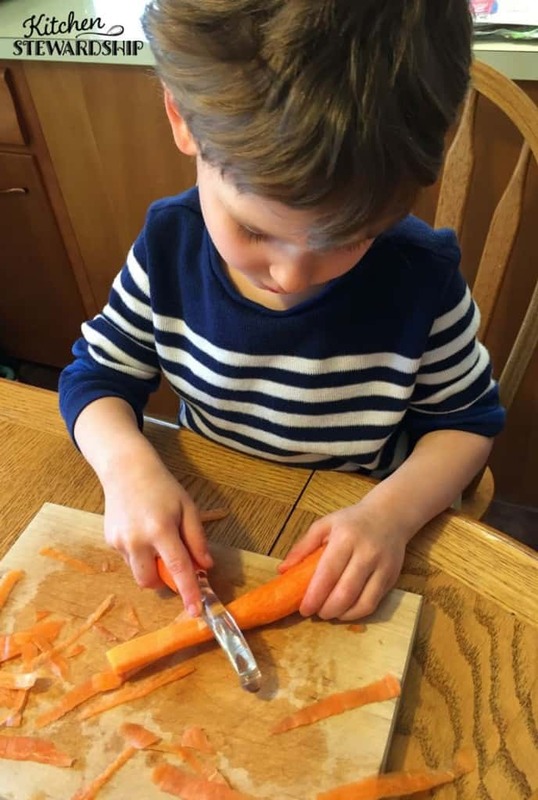 Just because you want your kids to have kitchen skills doesn’t mean it’s easy to waltz into the kitchen, hand your 4-year-old a peeler, and expect the carrots to come out NOT looking like shredded orange mush. Sometimes you need some outside wisdom and guidance from someone who has gone before. Or maybe you see the kitchen as your sanctuary and shoo the kids out to have some “me time” (yeah, I’m guilty of that one, too). If your kids aren’t spending time with you in the kitchen when you cook, how will they have the chance to learn from watching you? I think that’s why I love the Kids Cook Real Food eCourse so much. It’s designed for any adult to teach any kid of any age the proper skill set, safety, and know-how to navigate the kitchen (based on what is realistically appropriate for their age). The eCourse comes with a whole raft of printables, from a recipe book (carefully worded to be understood by kids) to flash cards that help summarize the main focus of that cooking lesson. The lesson plans themselves are also printable, and include troubleshooting advice, step-by-step instruction, and loads of information. There are also professionally-produced cooking videos where Katie provides teaching instruction and demonstrates the cooking skills for that lesson with real kids. The eCourse covers a wide range of topics, including peeling, knife skills (slicing, dicing, chopping, etc), sautéing, cracking eggs, measuring and pouring, making dough, cooking rice on the stove top, cooking dry beans – and soooooooo much more. To get a complete overview of the eCourse, check out the free curriculum map here. Here’s another perspective on the online cooking course from a homeschool mom who used the course to add life skills to her curriculum. 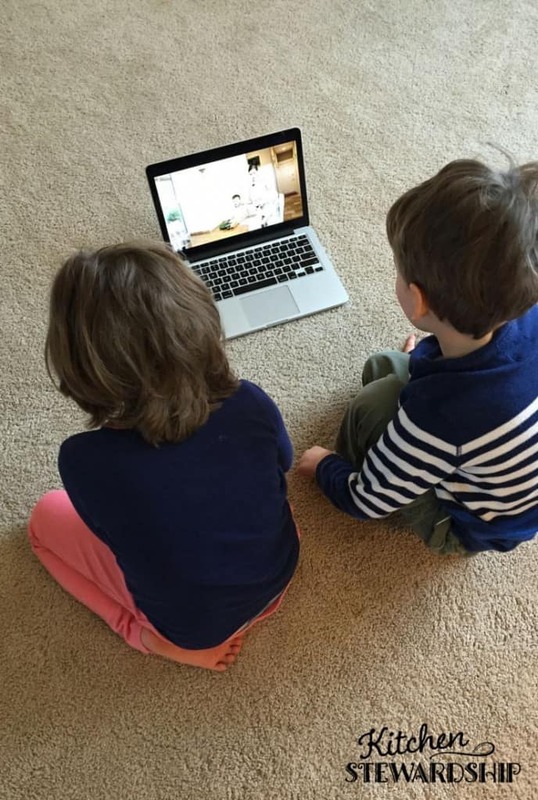 The video eCourse works well for homeschoolers and families with classroom educated children alike. How are your kids doing in the kitchen or with chores around the home? Is there a task you need to stretch and let them do?